As more and more evidence emerges, there is a suggestion that the majority of learning takes place in the workplace. This may also apply to the notion of how healthcare professionals learn to manage and lead. This would make sense as these professions are well situated being practice-based disciplines. There is currently limited information available on how to support this type of learning in the healthcare setting. 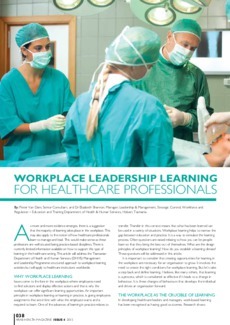 This article will address the Tasmanian Department of Health and Human Services (DHHS) Management and Leadership Programme structured approach to workplace learning activities but will apply to healthcare institutions worldwide.